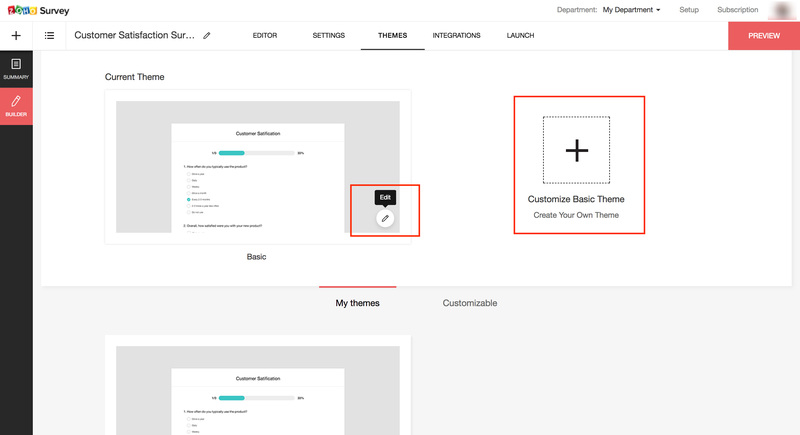 How to customize themes & styles in Zoho Survey? 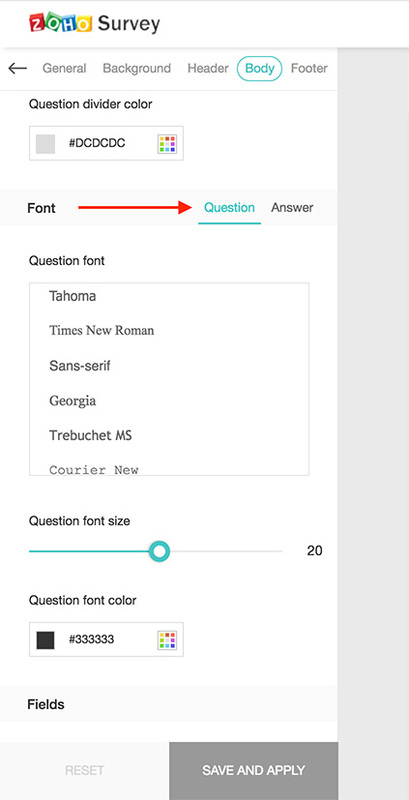 Play around with your survey's fonts, background, and colors. With our themes, you can change the look and feel as much as you like. Align it with your brand's image to give it a professional look. You can find your current theme here and edit it to suit your style. 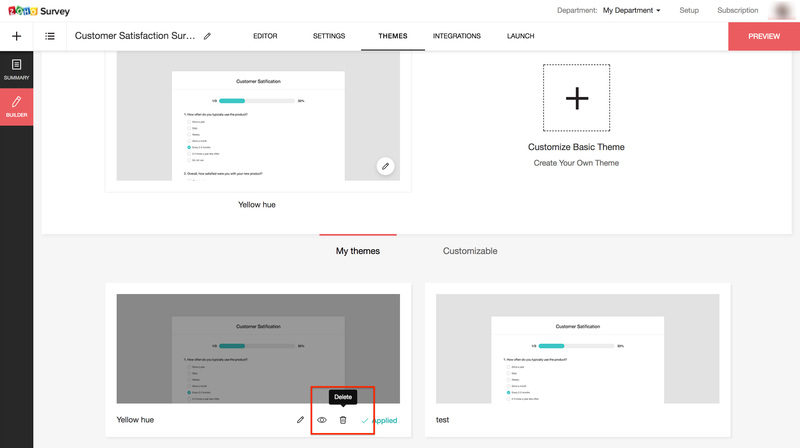 This tab contains a collection of all the themes you've applied or created. You can apply themes you've created in previous surveys to maintain consistency, or customize them for a fresh look. 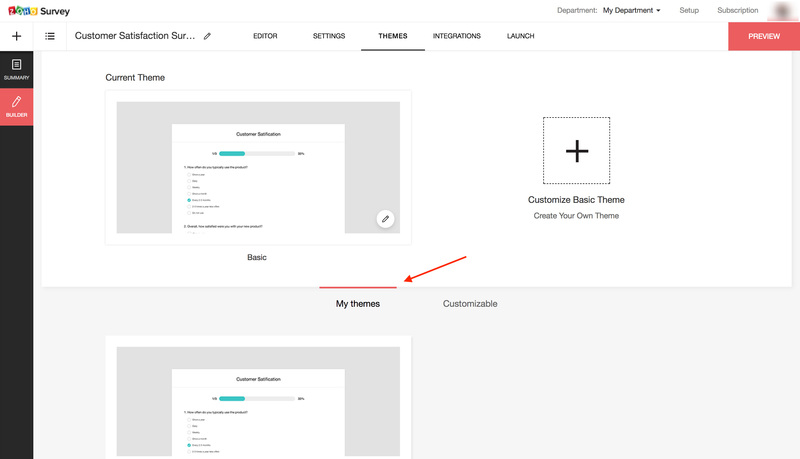 With any paid Zoho Survey plan, you can design your theme's entire appearance. To create a new customized theme, click the Add icon. You can also do this from the Customizable tab. Hover over a customizable theme and click the Edit icon. How do I preview my survey's theme? Hover over the theme and select the Preview option. You can also preview it by clicking the current theme. How do I create or edit a theme? 1. Click the Customize Basic Theme or Edit icons to get to the theme editor. 2. The left pane will display the customizable categories: general, background, header, body, and footer. Click any category to edit it. Set common customizations across my survey? Set a common color scheme across my survey? Select a common font for my survey? 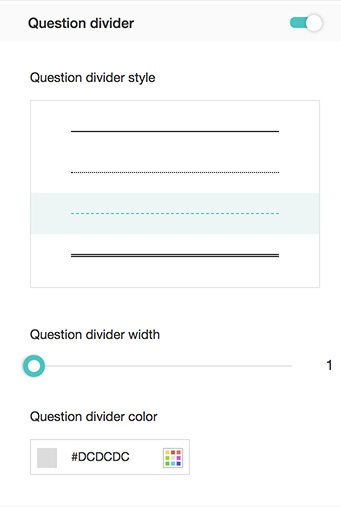 Adjust the survey form's background opacity, corners, and shadow? Style my survey form's with border patterns? Select my survey form's size? Upload an image to my survey's background? Choose a pattern for my survey's background? Align my survey's header (logo and title)? Upload a header background image? Add a logo or edit its appearance? Add a title or edit its appearance? Add a border to separate the survey's header and body? Select a color for the body's background? Edit the typography for questions and answers? Customize the appearance of answer fields (choice fields, on hover, selection)? Customize the appearance of text boxes? Edit the button's font, size, alignment, and border thickness? Select a color for my survey footer’s background? Change the font and font color of the footer text? Add a border to separate the footer and the body of the survey? How do I set common customizations across my survey? Click the Edit or Customize Basic Theme icon. The General tab in the left pane will be selected by default. 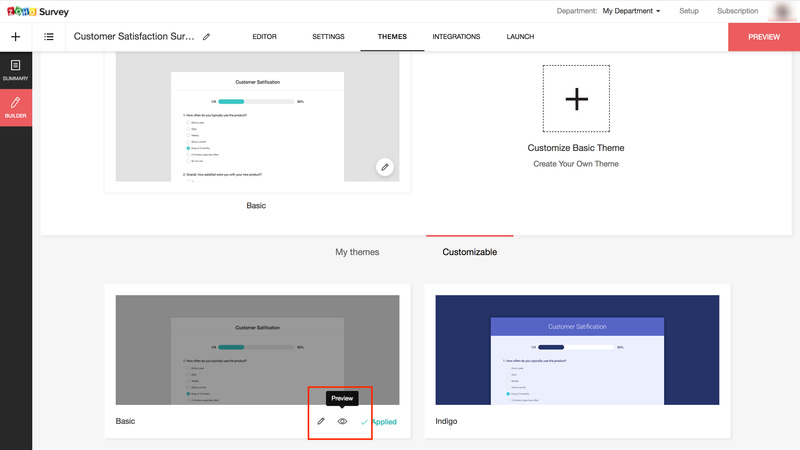 Use the options in this tab to set common customizations across your survey. How do I set a common color scheme across my survey? Select the General tab in the left pane. How do I select a common font for my survey? 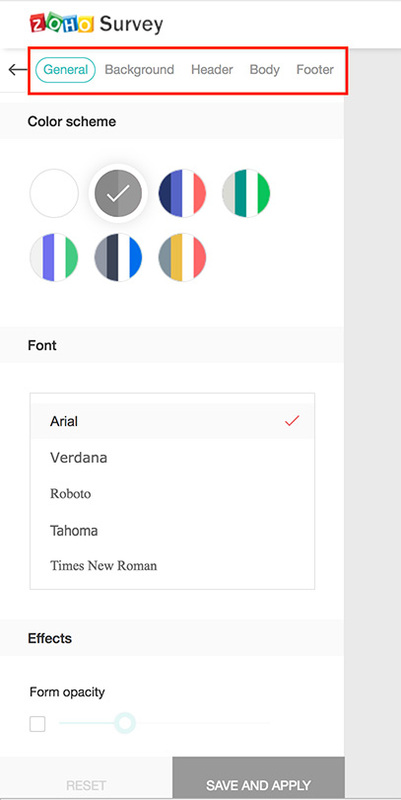 Select a style from the Font section. How do I adjust the survey form's background opacity, corners, and shadow? Scroll to the Effects section. Click and drag the sliders to adjust the background opacity, the roundness of the form's corners, and the shadow effect. How do I style my survey form's with border patterns? 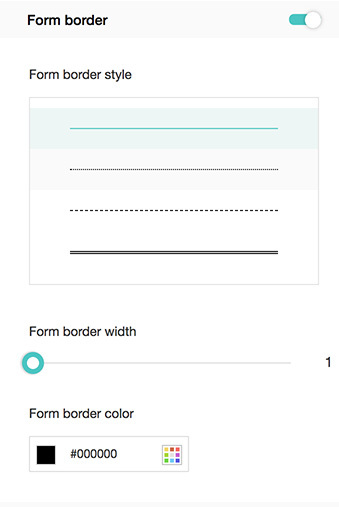 Scroll down and turn on the Form border settings to adjust the style, width and color of the border. 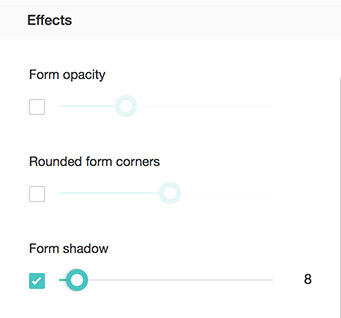 Click and drag the slider to adjust the form width. Click the color grid to choose a color. How do I select my survey form's size? Scroll down to the Form size section. How do I customize my survey's background? Select the Background tab in the left pane. Use the options in this tab to customize your background. How do I upload an image to my survey's background? Select the Background tab in the left pane. Click Browse. You can upload an image from your image gallery or enter a URL to add an image from the web. How do I choose a pattern for my survey's background? Select your preferred pattern. You can preview it from the form on the right. Click the color grid and select a pattern color. How do I customize my survey's header? Select the Header tab in the left pane. 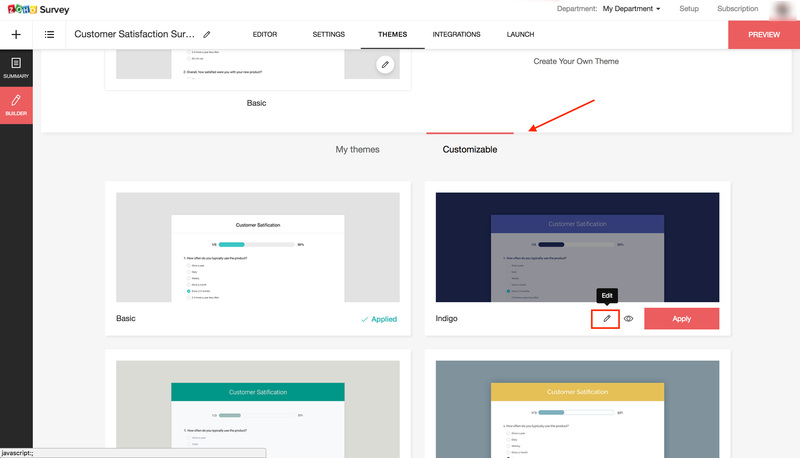 Use the options in this tab to customize your header. How do I align my survey's header (logo and title)? Select an Allignment, left, middle, or right, for your survey's logo and title. How do I upload a header background image? Scroll down to the Background section. Upload an image from your gallery or enter a URL to add an image from the web. You can also use the color grid to select a single color as your background. How do I add a logo or edit its appearance? Click the switch to display or hide the survey's logo. Note: The logo section can only be enabled if a logo has been uploaded in Settings. Click and drag the slider to adjust the logo's size. How do I add a title or edit its appearance? Scroll down to the Display title section. Click the switch to display or hide your survey's title. Click and drag the slider to adjust the size of the title's font. 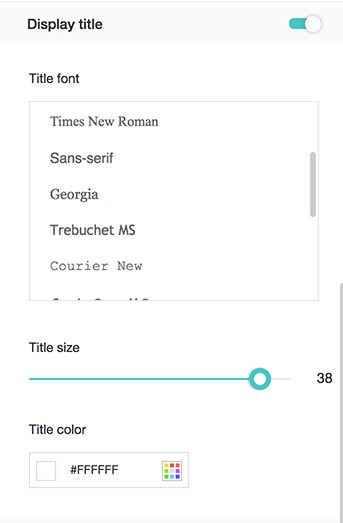 Click the color grid to choose a font color. How do I add a border to separate the survey's header and body? Scroll down to the Header divider section. Click the Header divider switch. Click and drag the slider to adjust the width. Click the color grid to choose the border's color. How do I customize my survey's body? Select the Body tab in the left pane. Use the options in this tab to customize your body. How do I select a color for the body's background? Select the Body tab in the left pane. Click the color grid, under Body background color, to choose a color. How do I customize the page description? Scroll down to the Page description section. Note: Page description customization options will only appear when you've added one to any of your pages. 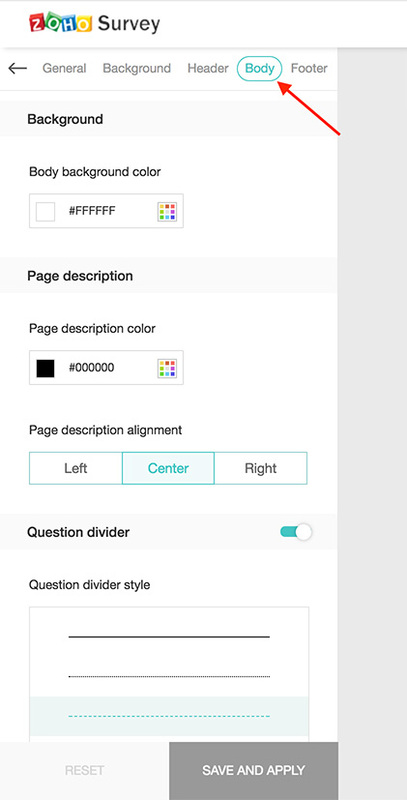 Click the color grid to choose a color for the page description. Choose left, center, or right alignment for your page description. How do I add a question divider? Scroll down to the Question divider section. Click the switch to enable or disable question dividers. 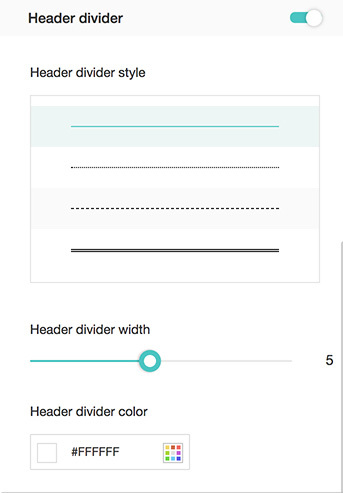 Click and drag the slider to adjust the divider's width. Click the color grid to choose the divider's color. How do I edit the typography for questions and answers? Scroll down to the Font section. Choose Question or Answer to edit the respective fields. Click and drag the slider to choose the font size. 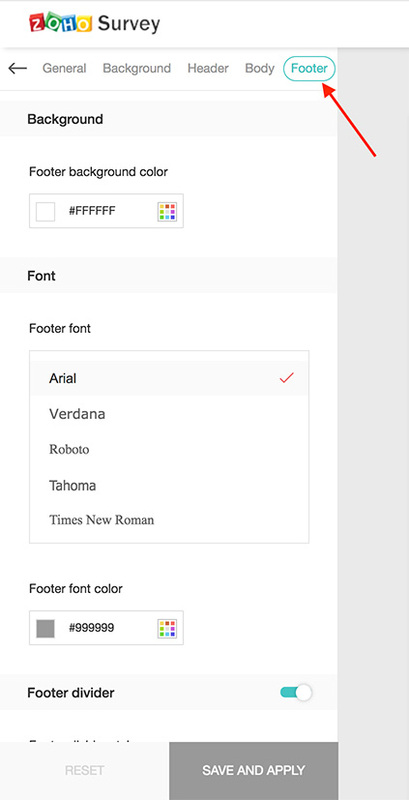 Click the color grid to choose the font color. How do I customize the appearance of answer fields (choice fields, on hover, selection)? Select colors for the different elements of the answer field. 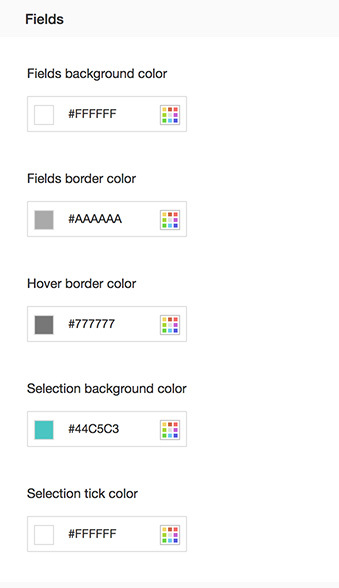 You can change the color of the background, border, hover border, selected field background, and selection tick. Click the color grid for each option to choose your preferred color. How do I customize the appearance of text boxes? Scroll down to the Text boxes section. Click and drag the slider to adjust border width. 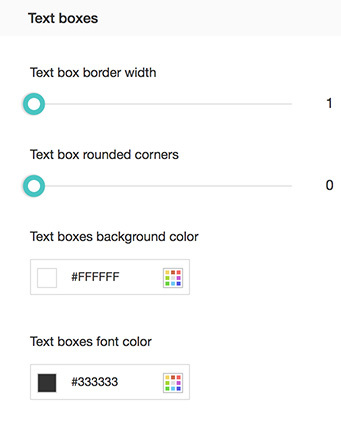 Click and drag the slider to adjust the roundness of the text boxes' corners. Click the color grid to select the background color. Click the second color grid to choose the font color. How do I edit the button's font, size, alignment, and border thickness? Scroll down to the Button section. Click and drag the slider to adjust border thickness. How do I edit the Navigation and Submit buttons' background color and opacity, font color, and border color? Select Navigation or Submit to customize the respective buttons. Note: Navigation buttons' options will only turn up if there are more than one pages in the survey. Click the color grid to choose a background color. Click and drag the slider to adjust the background opacity. Click the color grid to choose the border color. How do I customize the survey's footer? Select the Footer tab in the left pane. Use the options in this tab to customize your footer. How do I select a color for my survey footer’s background? Select the Footer tab in the left pane. 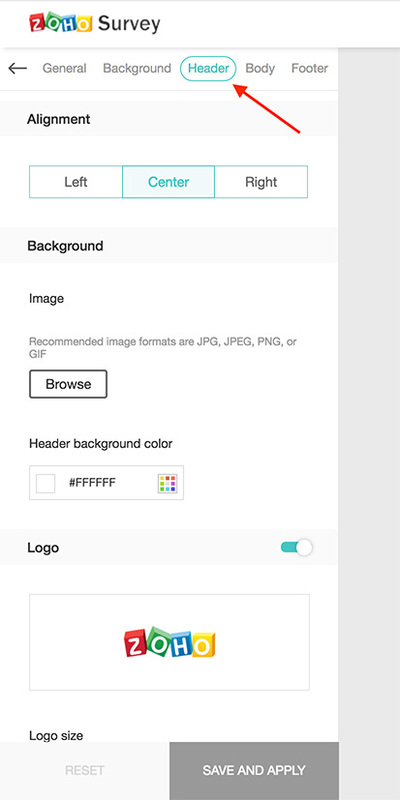 Click the color grid, the Background section, to choose a background footer color. How do I change the font and font color of the footer text? Select a font for the footer text. How do I add a border to separate the footer and the body of the survey? Scroll down to the Footer divider section. 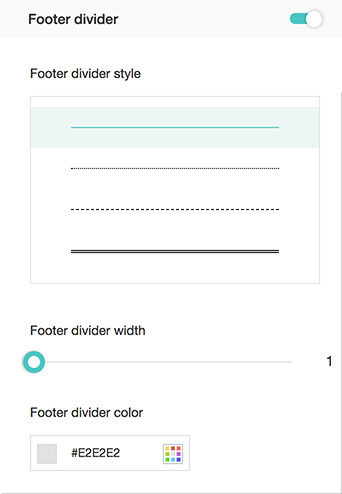 Click the Footer divider switch to enable and disable the footer divider. Click and drag the slider to adjust the border's width. Click the color grid for the border's color. How do I save my theme settings? Click the Save and Apply button at the bottom of the left panel after you've created your theme. Enter a name for the theme. It will be saved in My Themes. If you don't want to preserve your changes, just click Reset. Click My Themes, and hover over the theme you want to delete. Click the Delete icon. If you delete a theme that is currently applied to your survey, the default theme will apply instead.